A barnacle is a type of arthropod constituting the infraclass Cirripedia in the subphylum Crustacea, and is hence related to crabs and lobsters. Barnacles are exclusively marine, and tend to live in shallow and tidal waters, typically in erosive settings. 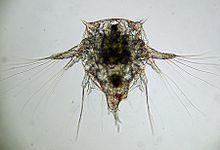 They are sessile (nonmobile) suspension feeders, and have two nektonic (active swimming) larval stages. Around 1,220 barnacle species are currently known. The name "Cirripedia" is Latin, meaning "curl-footed". The study of barnacles is called cirripedology. Barnacles are encrusters, attaching themselves permanently to a hard substrate. The most common, "acorn barnacles" (Sessilia), are sessile, growing their shells directly onto the substrate. 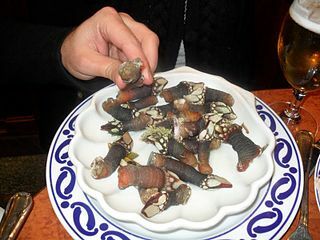 The order Pedunculata (goose barnacles and others) attach themselves by means of a stalk. Barnacles have no true heart, although a sinus close to the esophagus performs a similar function, with blood being pumped through it by a series of muscles. The blood vascular system is minimal. Similarly, they have no gills, absorbing oxygen from the water through their limbs and the inner membrane of their carapaces. The excretory organs of barnacles are maxillary glands. The main sense of barnacles appears to be touch, with the hairs on the limbs being especially sensitive. The adult also has three photoreceptors (ocelli), one median and two lateral. These photoreceptors record the stimulus for the barnacle shadow reflex, where a sudden decrease in light causes cessation of the fishing rhythm and closing of the opercular plates. The photoreceptors are likely only capable of sensing the difference between light and dark. This eye is derived from the primary naupliar eye. 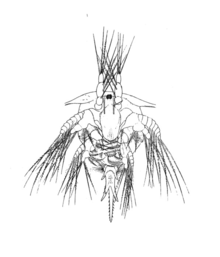 A fertilised egg hatches into a nauplius: a one-eyed larva comprising a head and a telson, without a thorax or abdomen. This undergoes six moults, passing through five instars, before transforming into the cyprid stage. Nauplii are typically initially brooded by the parent, and released after the first moult as larvae that swim freely using setae. The cyprid larva is the last larval stage before adulthood. It is not a feeding stage; its role is to find a suitable place to settle, since the adults are sessile. The cyprid stage lasts from days to weeks. It explores potential surfaces with modified antennules; once it has found a potentially suitable spot, it attaches head-first using its antennules and a secreted glycoproteinous substance. Larvae assess surfaces based upon their surface texture, chemistry, relative wettability, color, and the presence or absence and composition of a surface biofilm; swarming species are also more likely to attach near other barnacles. As the larva exhausts its finite energy reserves, it becomes less selective in the sites it selects. It cements itself permanently to the substrate with another proteinaceous compound, and then undergoes metamorphosis into a juvenile barnacle. Once metamorphosis is over and they have reached their adult form, barnacles continue to grow by adding new material to their heavily calcified plates. These plates are not moulted; however, like all ecdysozoans, the barnacle itself will still moult its cuticle. Most barnacles are hermaphroditic, although a few species are gonochoric or androdioecious. The ovaries are located in the base or stalk, and may extend into the mantle, while the testes are towards the back of the head, often extending into the thorax. Typically, recently moulted hermaphroditic individuals are receptive as females. Self-fertilization, although theoretically possible, has been experimentally shown to be rare in barnacles. The Rhizocephala superorder used to be considered hermaphroditic, but it turned out that its males inject themselves into the female's body, degrading to the condition of nothing more than sperm-producing cells. Other members of the class have quite a different mode of life. For example, members of the superorder Rhizocephala, including the genus Sacculina, are parasitic and live within crabs. 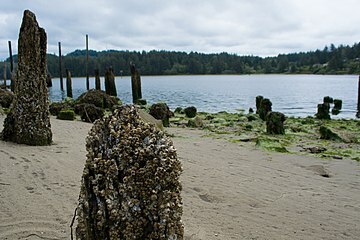 Competitors may include other barnacles, and disputed evidence indicates balanoid barnacles competitively displaced chthalamoid barnacles. Balanoids gained their advantage over the chthalamoids in the Oligocene, when they evolved tubular skeletons, which provide better anchorage to the substrate, and allow them to grow faster, undercutting, crushing, and smothering chthalamoids. Barnacles are of economic consequence, as they often attach themselves to synthetic structures, sometimes to the structure's detriment. Particularly in the case of ships, they are classified as fouling organisms. The amount and size of barnacles that cover ships can negatively impact their efficiency. The stable isotope signals in the layers of barnacle shells can potentially be used as a forensic tracking method for whales, loggerhead turtles and marine debris, such as shipwrecks or a flaperon suspected to be from Malaysia Airlines Flight 370. ^ Martin Walters & Jinny Johnson (2007). The World of Animals. Bath, Somerset: Parragon. ISBN 978-1-4054-9926-2. ^ a b c d e f g h i j k l P. Doyle; A. E. Mather; M. R. Bennett; A. Bussell (1997). "Miocene barnacle assemblages from southern Spain and their palaeoenvironmental significance". Lethaia. 29 (3): 267–274. doi:10.1111/j.1502-3931.1996.tb01659.x. ^ Let's learn about the body structure of a barnacle Archived 2012-01-25 at the Wayback Machine Retrieved 2011-11-28. ^ Gwilliam, G.F.; Millecchia, R. J. (January 1975). "Barnacle photoreceptors: Their physiology and role in the control of behavior". Progress in Neurobiology. 4: 211–239. doi:10.1016/0301-0082(75)90002-7. ^ a b Barnes, Robert D. (1982). Invertebrate Zoology. Holt-Saunders International. pp. 694–707. ISBN 978-0-03-056747-6. ^ Thursten C. Lacalli (2009). "Serial EM analysis of a copepod larval nervous system". Arthropod Structure & Development. 38 (5): 361–75. doi:10.1016/j.asd.2009.04.002. PMID 19376268. ^ a b William A. Newman (2007). "Cirripedia". In Sol Felty Light; James T. Carlton (eds.). The Light and Smith Manual: Intertidal Invertebrates from Central California to Oregon (4th ed.). University of California Press. pp. 475–484. ISBN 978-0-520-23939-5. ^ Ruppert, Edward E.; Fox, Richard, S.; Barnes, Robert D. (2004). Invertebrate Zoology, 7th edition. Cengage Learning. p. 683. ISBN 978-81-315-0104-7. ^ a b Donald Thomas Anderson (1994). "Larval development and metamorphosis". 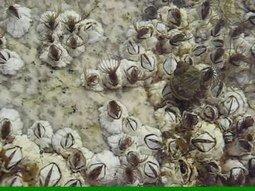 Barnacles: Structure, Function, Development and Evolution. Springer. pp. 197–246. ISBN 978-0-412-44420-3. ^ E. Bourget (1987). Barnacle shells: composition, structure, and growth. pp. 267–285. In A. J. Southward (ed. ), 1987. ^ a b "Biology of Barnacles". Museum Victoria. 1996. Archived from the original on February 17, 2007. Retrieved April 20, 2012. ^ E. L. Charnov (1987). Sexuality and hermaphroditism in barnacles: A natural selection approach. pp. 89–104. In A. J. Southward (ed. ), 1987. ^ Christine Dell'Amore (15 January 2013). "Barnacles Leak Sperm Into Ocean, Upending Mating Theory". National Geographic. ^ Carl Zimmer (2000). Parasite Rex: Inside the Bizarre World of Nature's Most Dangerous Creatures. Free Press. ISBN 978-0-7432-0011-0. ^ Stacy E. Leone (2008). Predator induced plasticity in barnacle shell morphology (PDF) (Master of Arts in Biology thesis). New Britain, Connecticut: Central Connecticut State University. Archived from the original (PDF) on 2009-12-29. ^ S. M. Stanley (2008). "Predation defeats competition on the seafloor". Paleobiology. 34 (1): 1–21. doi:10.1666/07026.1. ^ C. D. G. Harley; M. S. Pankey; J. P. Wares; R. K. Grosberg; M. J. Wonham (2006). "Color Polymorphism and Genetic Structure in the Sea Star Pisaster ochraceus". The Biological Bulletin. 211 (3): 248–262. doi:10.2307/4134547. JSTOR 4134547. PMID 17179384. ^ Jan Holmes (2002). "Seashore players most successful when they're in their zone". WSU Beach Watchers. Archived from the original on 2010-06-21. Retrieved March 6, 2010. ^ a b Richmond, Marsha (January 2007). "Darwin's Study of the Cirripedia". Darwin Online. Retrieved 16 June 2012. ^ Étienne Benson. "Charles Darwin". SparkNotes. Archived from the original on 29 September 2007. Retrieved August 30, 2007. ^ Joel W. Martin & George E. Davis (2001). An Updated Classification of the Recent Crustacea (PDF). Natural History Museum of Los Angeles County. ^ B. A. Foster & J. S. Buckeridge (1987). 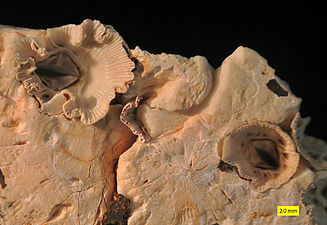 Barnacle palaeontology. pp. 41–63. In A. J. Southward (ed. ), 1987. ^ "Newcastle University Biofouling Group". Newcastle University. Archived from the original on June 5, 2009. Retrieved January 15, 2010. Alan J. Southward, ed. (1987-06-01). Barnacle Biology. Crustacean Issues. 5. Leiden, Netherlands: CRC Press / A. A. Balkema. ISBN 978-90-6191-628-4. Calman, William Thomas (1911). "Barnacle" . Encyclopædia Britannica. 3 (11th ed.). p. 409.